The Broward Sheriff's Office on Wednesday released exterior surveillance videos showing law enforcement's response to the Marjory Stoneman Douglas High School shooting after the Florida Supreme Court cleared the way for their release. The court on Wednesday declined to review a lower court's decision to release the video from the Feb. 14 shooting that killed 17 people. 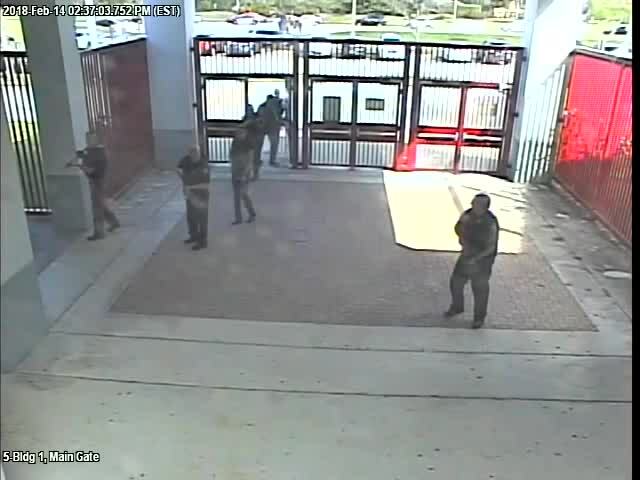 The video files released show footage from outside different buildings on the school's campus and blurs the faces of the students. Some students are seen running from buildings as deputies and officers respond with weapons drawn. The 4th District Court of Appeal had previously ordered disclosure of the video as sought by media organizations. The Broward County School Board contended releasing the video might reveal security blind spots at the school. Prosecutors had also opposed release because it could be evidence in a criminal case. Authorities say the school had 70 operating video cameras that day. The media organizations were not seeking any footage depicting the massacre or any victims, but rather the video from outside the shooting scene at the school's Building 12 that depicts law enforcement actions. The school's resource officer, former Broward Deputy Scot Peterson, retired amid accusations that he failed to follow sheriff's office policy when he remained outside the building instead of going inside to confront the shooter. Victims' parents and others have also charged that first responders hesitated in a way that might have cost lives. Video of Peterson's actions has been released. Nineteen-year-old Nikolas Cruz faces the death penalty if convicted of the mass shooting. His lawyers say he would plead guilty in exchange for a life prison sentence. Information from the Associated Press used in this report.